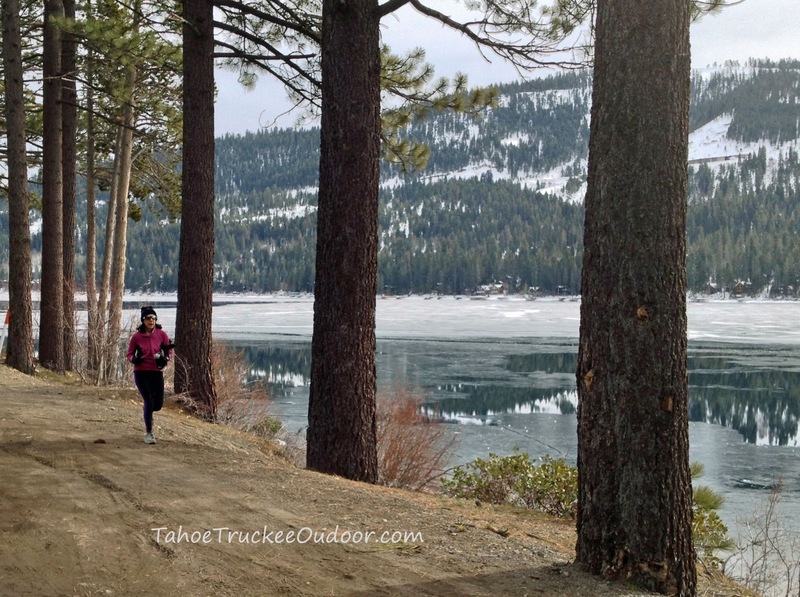 The Donner Lake Loop can be very runnable, even in February. There are a number of variables that determine a safe run around the lake. It may take a week or more after a big storm to make the loop safe. Make sure the snowplows have cleared Donner Pass Road wide enough to show the bike trail on both sides. The trails and roadways inside Donner Memorial Park aren't plowed, so the snow has to become firm before you can run on it. The snow is usually firm enough to run on about a week after a storm. If the roadways inside the park have been groomed for skiers, the firmness time is reduced. I like to run early in the morning when the snow and ice are frozen. Once things start to thaw, the surface becomes slippery and Donner Pass Road can become muddy. When my wife and I ran the lake today, we staged from the public boat ramp on the West Shore. 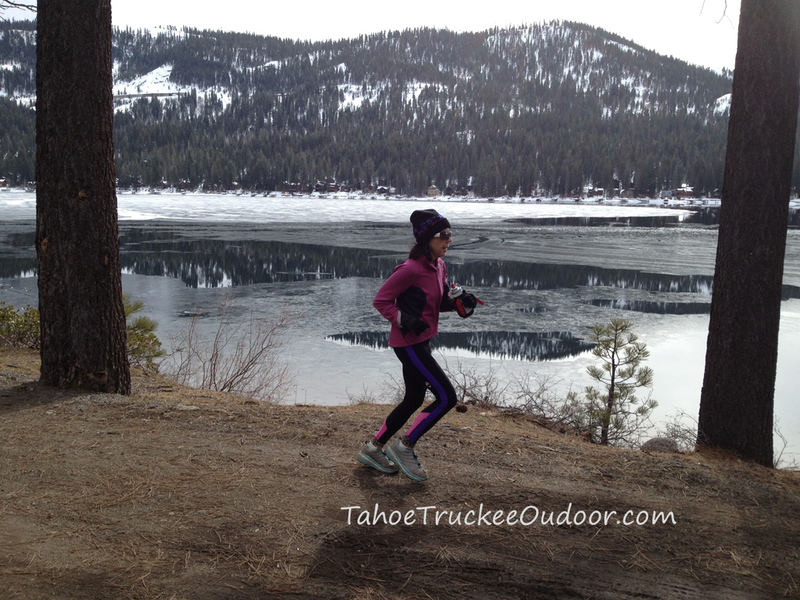 My wife ran the complete loop counter-clockwise, through the groomed roads in Donner State Park, then back on Donner Pass Road to the car. She recorded a distance of 7 miles. 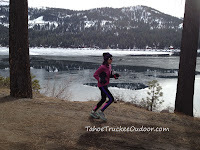 I ran an out-and-back along the south shore to the Donner State Park entrance kiosk and returned. I recorded a distance of 8.3 miles. I chose this route to eliminate the cars and congestion along Donner Pass Road. Don't wait for spring to run the lake loop. A little bit of snow makes it fun and just adds to the challenge. The scenery along the way is of course beautiful. Bring your own water. Faucets are turned off in the winter. All the bathrooms are closed. Wear trail shoes if you own them. Traction is your friend. Don't overdress. You will warm up quickly.